This is one of my favorite desserts: it’s easy, beautiful and can be made with whatever fruit you have in season. Last night I made a version with fresh local blueberries and apricots. 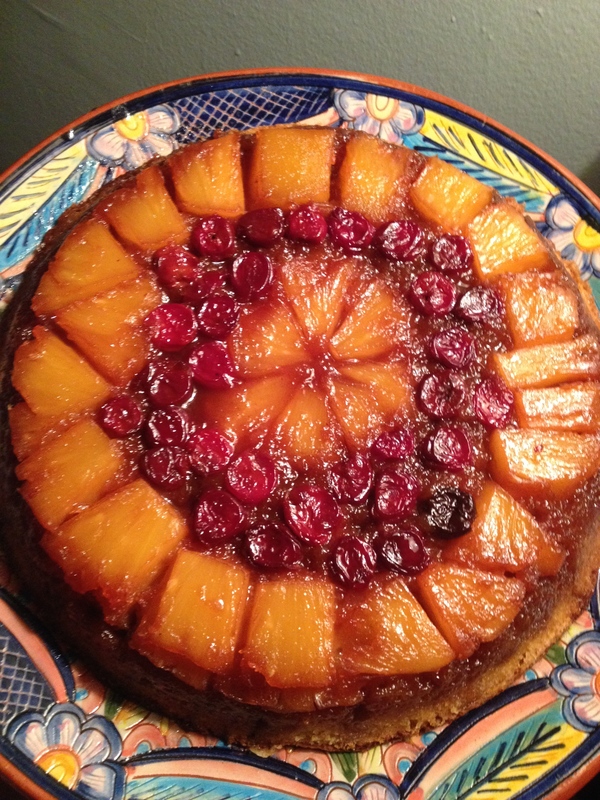 The version pictured is my variation of the classic pineapple upside down cake which I make with fresh pineapple and sour cherries. Upside down cake makes an elegant end of meal sweet served with a dollop of whipped cream. But it’s equally good in the morning with coffee or even for late night drunken fridge snacking. After years of experimenting with a dozen different recipes the winner was one by Alice Waters. I’ve made a few minor changes to the original recipe. This cake is very versatile and can be made with pineapples, peaches, plums, sour cherries or any full-flavored, slightly acidic fruit. Measure into an 9″cast-iron skillet 4 tablespoons (1/2 stick) unsalted butter, ¾ cup brown sugar and 4 tablespoons apricot juice (or whatever juice comes off the fruit you are using or sometimes I use rum 😉 Cook over medium heat, stirring constantly, until the butter melts and starts to bubble. Remove from the heat and allow to cool. Arrange the apricots on the brown sugar and butter mixture, cut sides facing up. Sprinkle the blueberries on top of the apricots. Separate 2 large eggs, at room temperature into two bowls. Make sure the egg whites are in a bowl big enough to beat them in. Measure out ½ cup room temperature whole milk and set aside. 2 teaspoons baking powder and ¼ teaspoon salt. In the bowl of a standing mixer, beat to lighten: 8 tablespoons (1 stick) unsalted butter, softened and 1 cup granulated sugar. Cream until light and fluffy. Beat in the 2 yolks, one at a time. Stir in: 1 teaspoon vanilla extract. Then add the flour mixture alternately with the milk, starting and ending with flour. Stir just until the flour is incorporated. Beat the 2 egg whites until they hold soft peaks. Fold one-third of the egg whites into the batter and then gently fold in the rest. Pour the batter over the fruit in the pan and smooth the top with a spatula. Bake for 35 to 40 minutes or until the top is golden brown and the cake pulls away from the sides of the pan. Remove from the oven and allow the cake to cool for 15 minutes. Run a knife around the edge of the pan and invert the cake on to a serving plate. This entry was posted in Video and tagged apricot blueberry upside down cake, arpicots, Baking, Blueberries, pineapple sour cherry upside down cake, upside down cake. Bookmark the permalink.